Bloggers trooped Friday night to the PETA-Phinma Theater in Quezon City for the Philippine Blog Awards 2009 which carried the theme “One Blogging Nation”. I had the privilege of sharing the stage with Benj Espina of Atheista.net, a fellow crew member at Bloggers Kapihan, as presentors for the last four award categories. 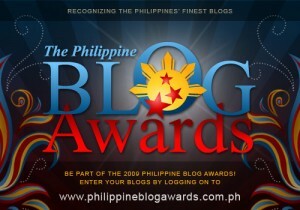 Last year, both Benj and I won awards for best personal blog and best news and media blog categories. Best Fashion Blog: who is elyoo? Best Gaming Blog: Mike Got Game! This year’s Bloggers’ Choice honors went to Micamyx.com. Good Times Manila won the Chikka Media-Philippine Blog Awards Reader’s Choice Award. Geisler-Maclang’s “Transformative Influencer Award” went to Jonel Uy of Lets Go Sago, who also won the grand prize — a Nokia E75 — in the grand raffle. RalphGuzman.org was likewise awarded as the Flippish Viewer’s Choice for Personal Blog. It was also during our turn on the podium when the Philippine Blog Awards paid tribute to journalist and techie Alecks Pabico who died Wednesday. Pabico was multimedia editor of the Philippine Center for Investigative Journalism. He put he PCIJ on the worldwide web and made history with the PCIJ Blog, the first institutional blog of a major news organization in the country. With Pabico at the helm, the PCIJ won the best news and media award in 2007, and the best podcast award in 2008. Congratulations to all the winners and to the organizers as well. Thank you, too, Gang Badoy of Rock Ed Philippines for her keynote speech that should serve as a call to action to bloggers. Congratulations for all the winners and happy 2010.